by Terence P. Jeffrey: The federal government passed a fiscal milestone on the first business day of fiscal 2017—which was Monday, Oct. 3—when the total federal debt accumulated during the presidency of Barack Obama topped $9,000,000,000,000 for the first time. Given that there were 118,215,000 households in the United States in June (the latest estimate from the Census Bureau), the $9,036,534,448,884.32 increase in the federal debt under Obama so far equals approximately $76,442 per household. The Treasury divides the total debt into two major parts: "debt held by the public" and "intragovernmental debt." Debt held by the public are U.S. government securities—including bills, notes and bonds—held by individuals and institutions outside the U.S. government. Intragovernmental debt is the money that the Treasury has borrowed and spent out of federal government trust funds such as those for the Social Security program. 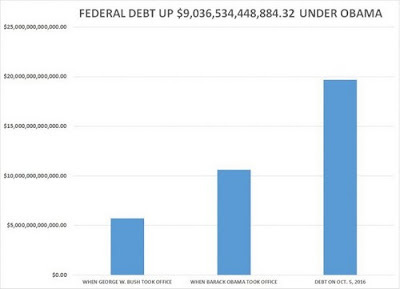 According to the Treasury, during Obama’s time in office so far, the "debt held by the public" has climbed from $6,307,310,739,681.66 on Jan, 20, 2009 to $14,170,897,492,757.91 on Oct. 5, 2015. That is an increase of $7,863,586,753,076.25—or about 125 percent. The amount that President Obama has increased the total federal debt so far--$9,036,534,448,884.32—is $4,137,434,138,275.88 more (or 84 percent more) than President George W. Bush increased the debt during his full eight years in office. It took the United States, which declared independence in 1776, 231 years to accumulate its first $9,000,000,000,000 in debt—with the debt first surpassing that level on the last day of August 2007. Terence P. Jeffrey is editor-in-chief of the conservative CNSNews.com. Previously, he served for more than a decade as editor of Human Events, where he is now an editor at large. Tags: Terence Jeffrey, CNS News, Debt, Under Obama, Up $9,000,000,000,000 To share or post to your site, click on "Post Link". Please mention / link to the ARRA News Service. and "Like" Facebook Page - Thanks!